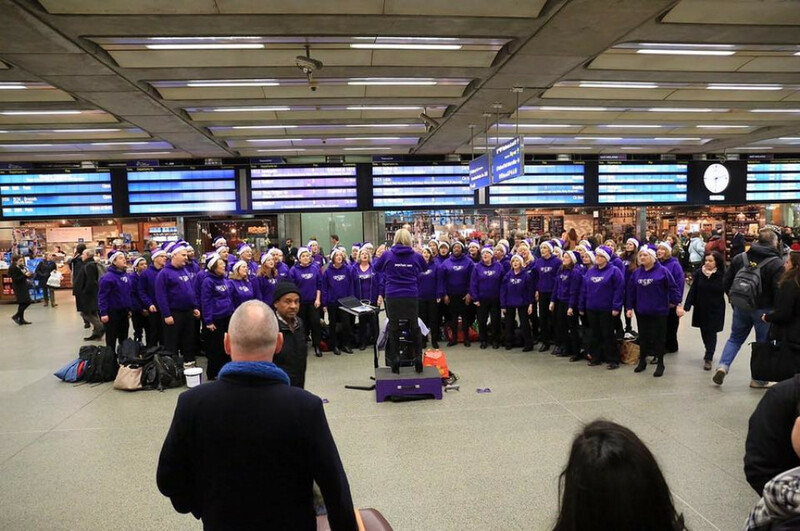 A wonderful lunchtime slot and evening singing for the commuters in Kings Cross Station, in aid of Kidasha. Kidasha provide protection, education, healthcare, and the possibility of a better future to the most vulnerable and disadvantaged children in Nepal. We received a fantastic reception from everyone at the station, and alongside some of the most engaged and enthusiastic charity collectors we have worked with, a stunning total was collected. It was definitely all down to the Power of the Purple People!! 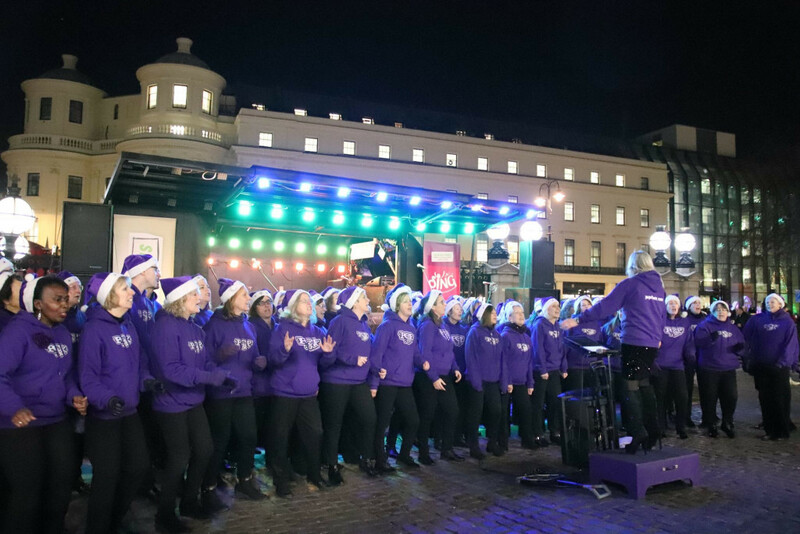 Our second night perfomring in Covent Garden was just as fantastic, supporting a charity which is so important all year round but particularly so during the winter months. An amazing £1692.45 was collected during the performance to support the wonderful work of Crisis. A wonderful time singing at Purley Tesco to help raise money for the South East Cancer Help Centre and all of the wonderful work they do in the local area. 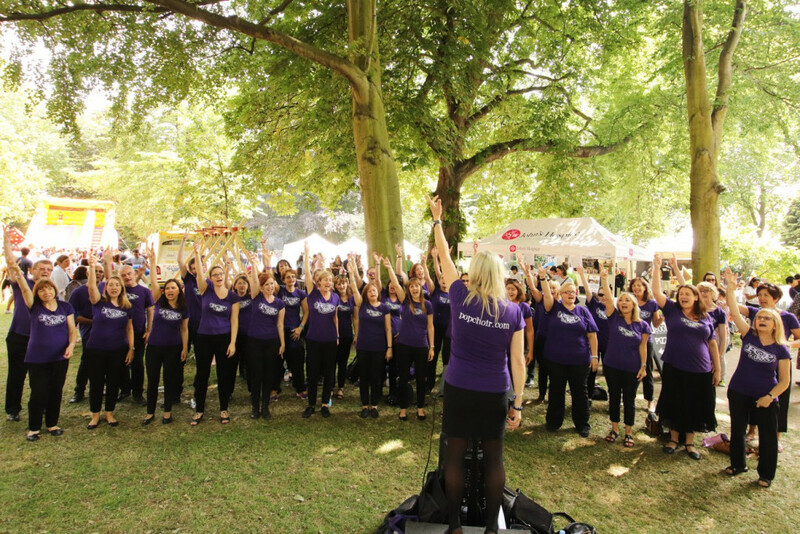 A wonderful day in the sunshine, singing to support the work of St John's Hospice. The two day Summer Fayre raised a staggering £25,000 to help continue the fantastic work of the hospice locally. We really love to be able to support charities, and it's especially good to be able to help raise funds for a small local one. The Maypole Project in Bromley helps children with complex medical needs in the local area. They are a vital resource for any family facing a difficult and uncertain future with their child. 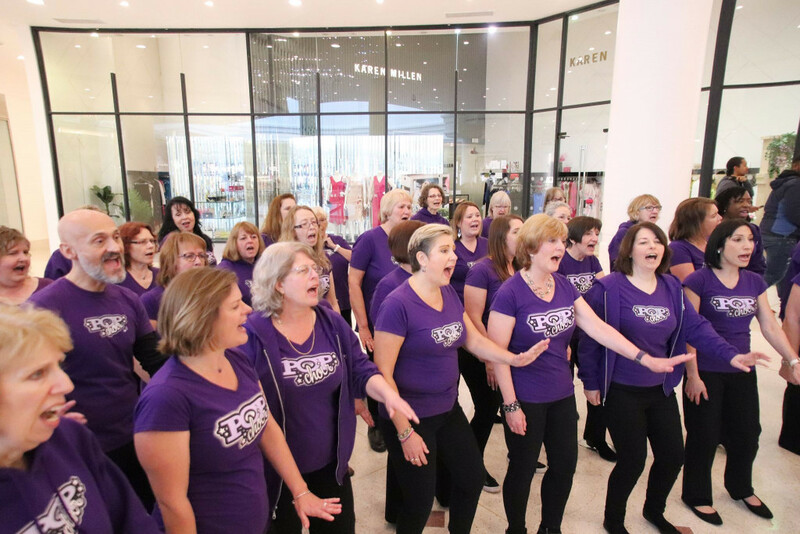 We were delighted to be one of several choirs who performed throughout the day at The Glades shopping centre and were so pleased with the fabulous reaction and the gathered crowd, and to see the buckets filling up while we sang. Thank you to everyone who donated as they went by or while they watched. A fantastic £460.40 was raised, and the money will fund vital work that will really make a difference to families in the area. What could be better than a concert of our favourite Christmas songs in the beautiful setting of St Andrew, Holborn all in aid of our key charity this year, London's Air Ambulance!? 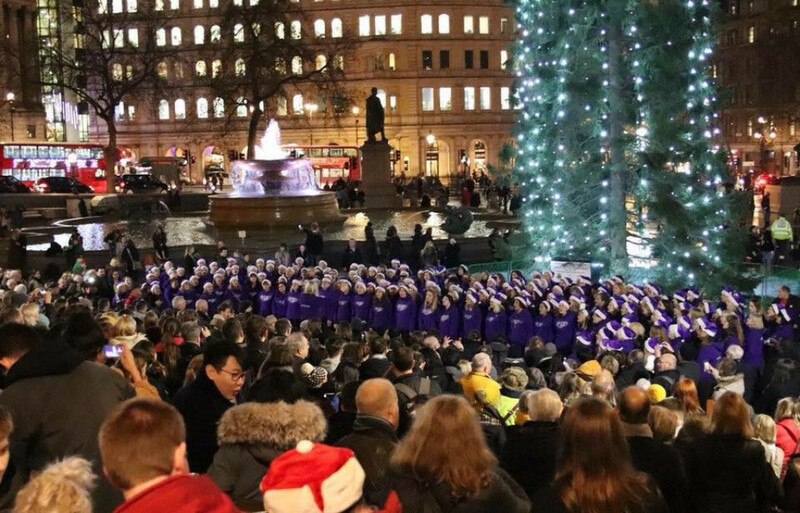 On Tuesday 12th December we took over this stunning City of London church and brought it alive to the sound of Popchoir at its most fun and frivolous, all washed down with mulled wine, prosecco and mince pies! 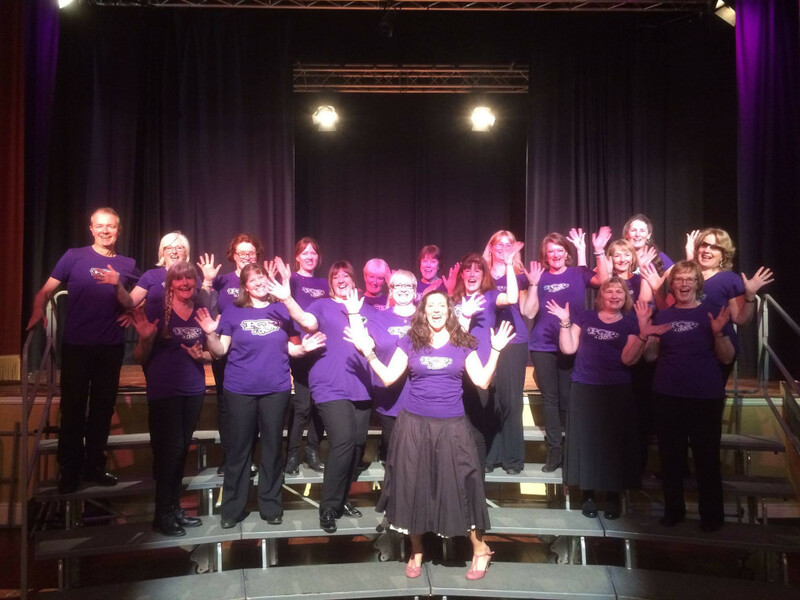 It was a fabulous night and we are grateful to all our members who sang so brilliantly and our friends and supporters who came to hear us and helped to raise an amazing £4000 overall. 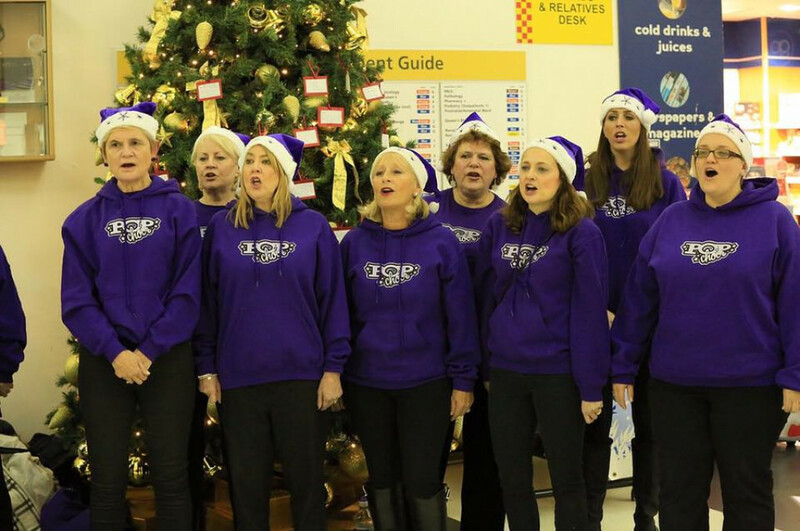 Our wonderful Launceston choir were singing at Tesco today to raise money for Tesco's charity of the year. 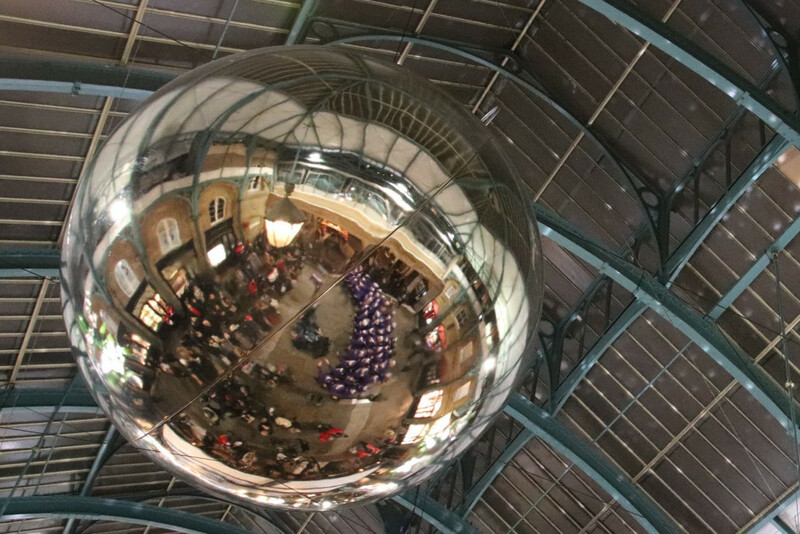 It's cold in that entranceway, but our intrepid choir sang for 45 minutes much to the delight of all the shoppers and raised £58 in the process! 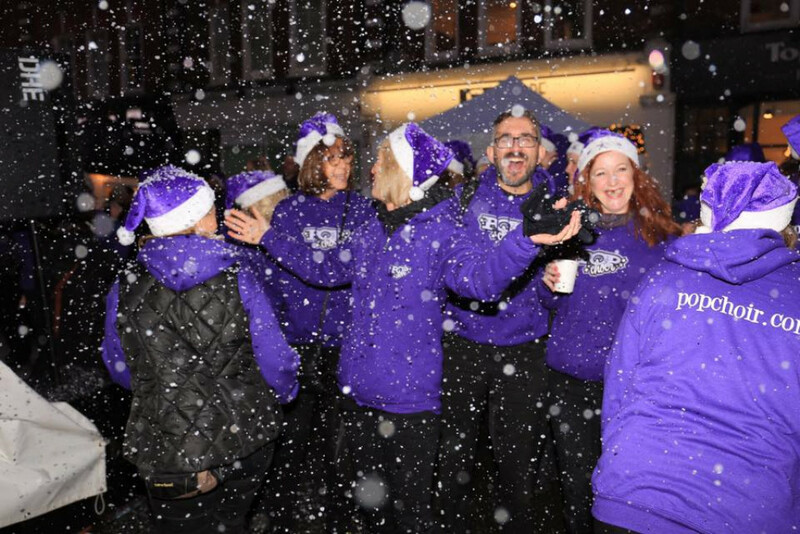 Another year and back to one of our favourite Christmas gigs - helping to raise funds for St John's Hospice at their annual Christmas Fayre on St John's Wood High Street. This year an incredible £22,000 was raised at this event, and we're extremely proud to have been part of that fundraising effort. £1249.21 to Canine Partners, £1352.81 to MIND and £1121.76 to London's Air Ambulance. Our lovely Launceston choir joined forces with the Launceston Male Voice Choir to raise momey for their local hospital. It went so well that they've got more joint events planned! 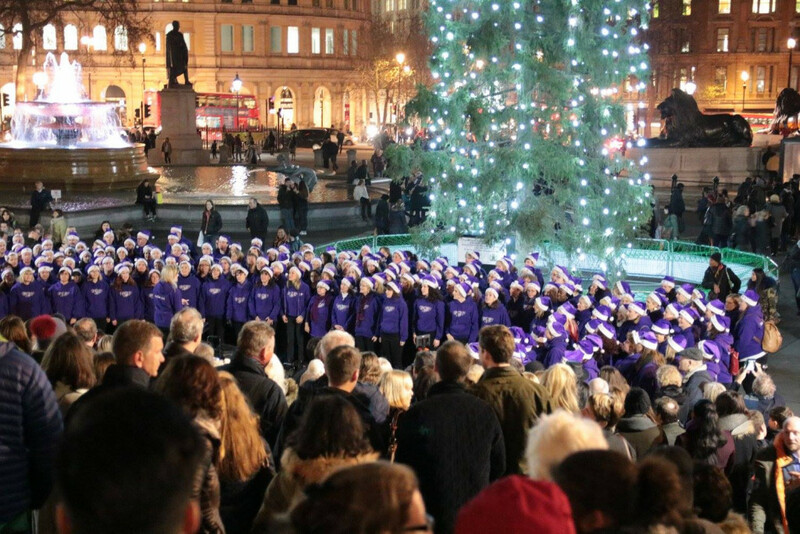 It's truly magical to sing at the foot of the Trafalgar Square Christmas Tree. 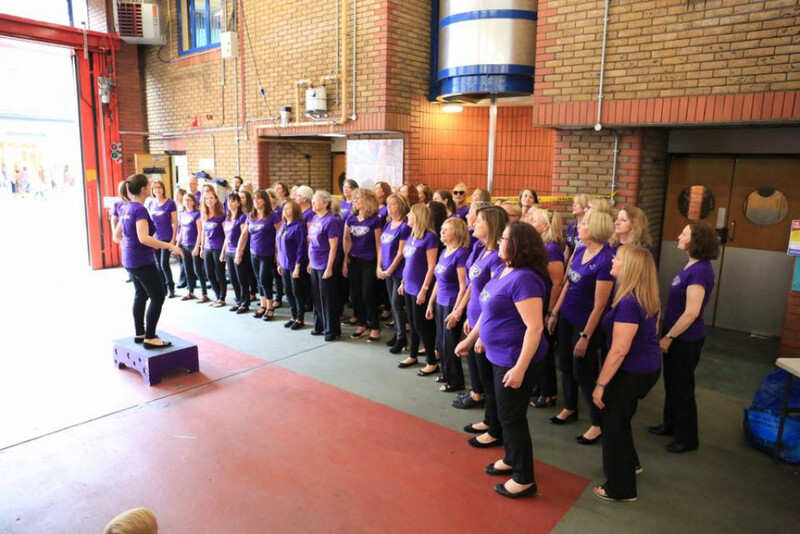 We were so pleased to raise £570 for the Royal Voluntary Service and our performance was featured on London Live. 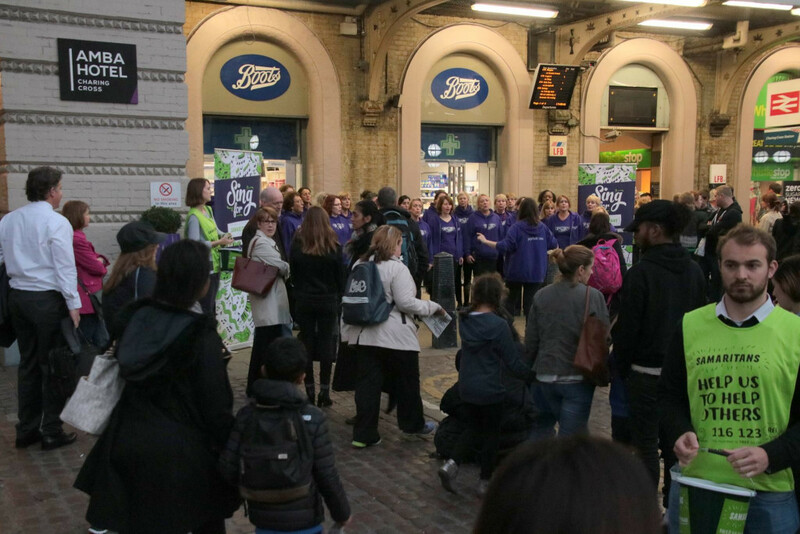 We took part in the Sing for Samaritans campaign (which raised over £20,000 in total) and cheered up the commuters! 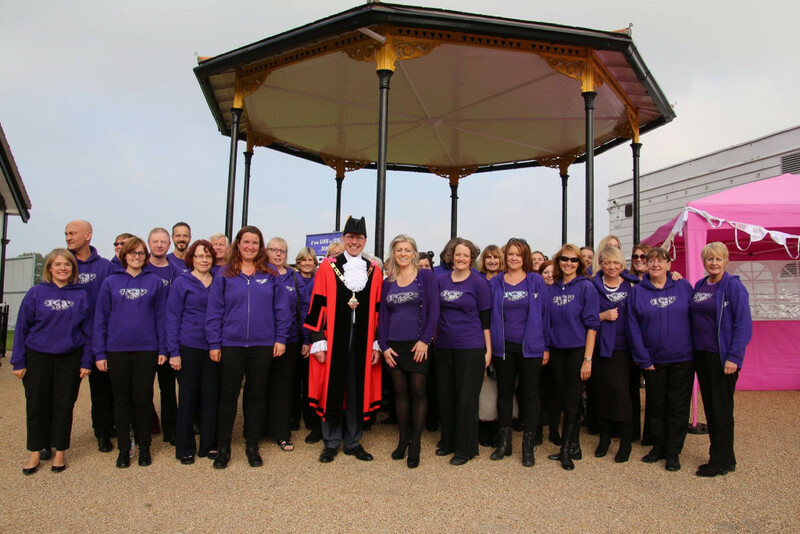 We helped launch Pink Week for Breast Cancer Care in Sevenoaks by performing in the wonderful Bandstand at The Vine. We had a fantastic night at KOKO in Camden with all of us determined to raise as much money as we could for this wonderful charity. 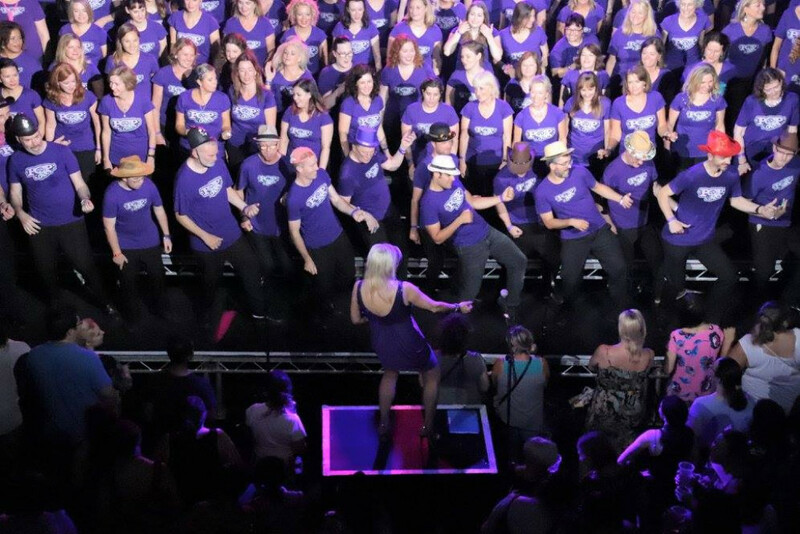 An incredible £6640 was raised for Great Ormond Street Hospital Charity at this amazing party-like gig ! 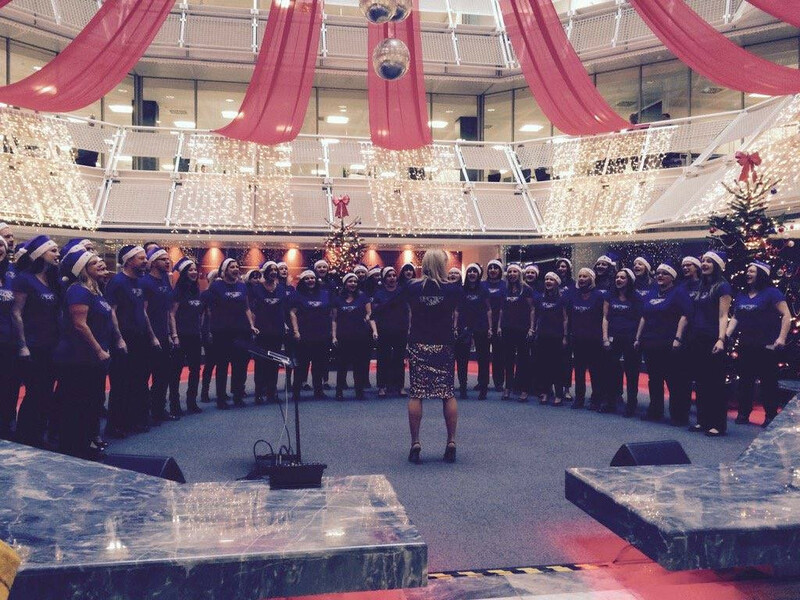 Our Loughton choir entertained staff, visitors and patients and raised funds for Kings & Queens Charity Trust. We helped to raise £14,000! We helped to raise £2000! 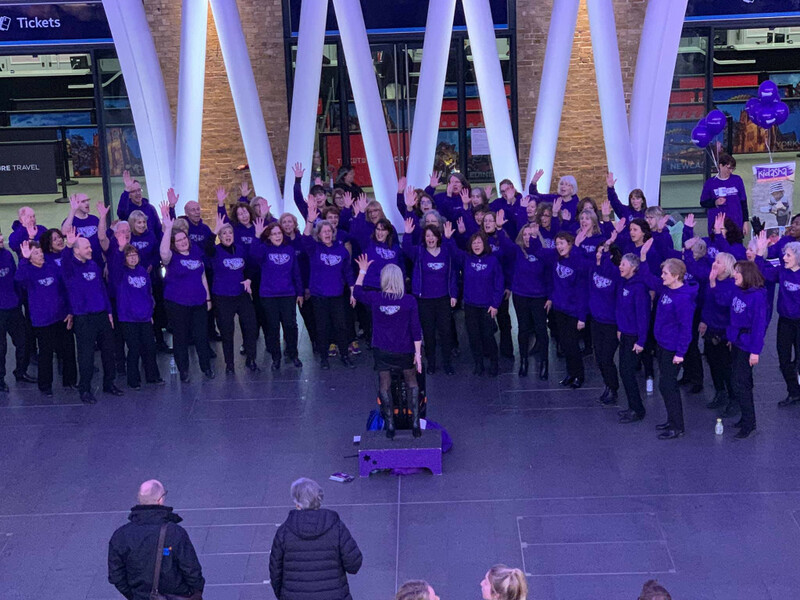 What a great hour we had - we may have had to battle the ever increasing noise of the tannoy, but commuters loved our singing, and showed us with their generosity! We raised £700! We had such a fun night at this talent packed event. There was never a dull moment and the whole evening made a fabulous £6,300! London Bridge station commuters are some of the most generous, we have discovered! 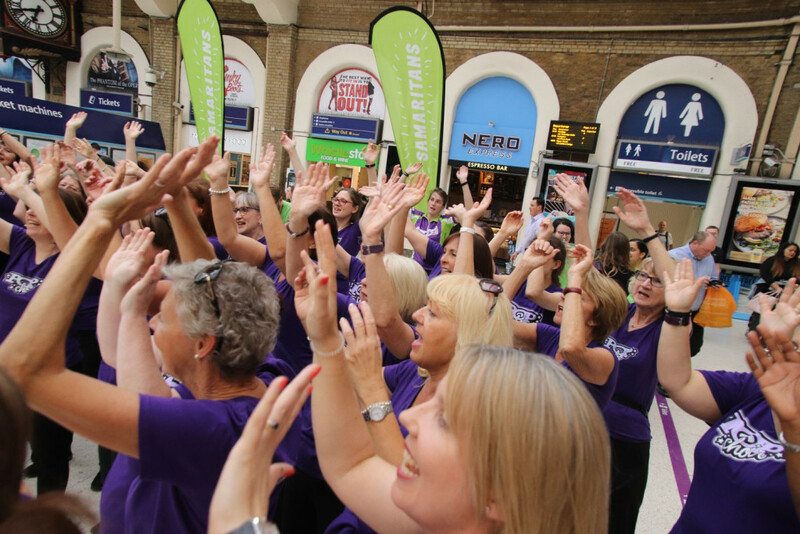 An hours singing on the concourse and we raised a fabulous £1020! A fantastic night at the Half Moon in Herne Hill. Lots of fabulous singing from our members and guests and a great night was had by all (including the bar staff who loved it!! ) We raised an amazing £1,493.06! 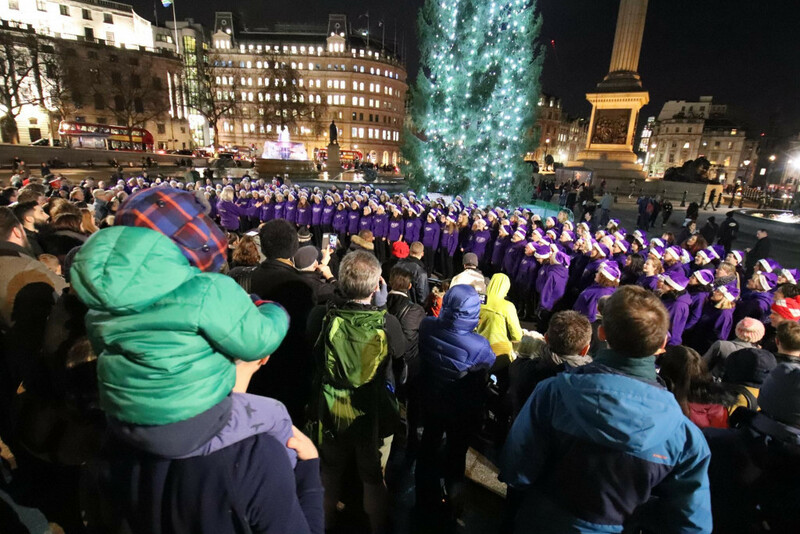 Our last gig of the year was at Trafalgar Square raising money for London Air Amublance. 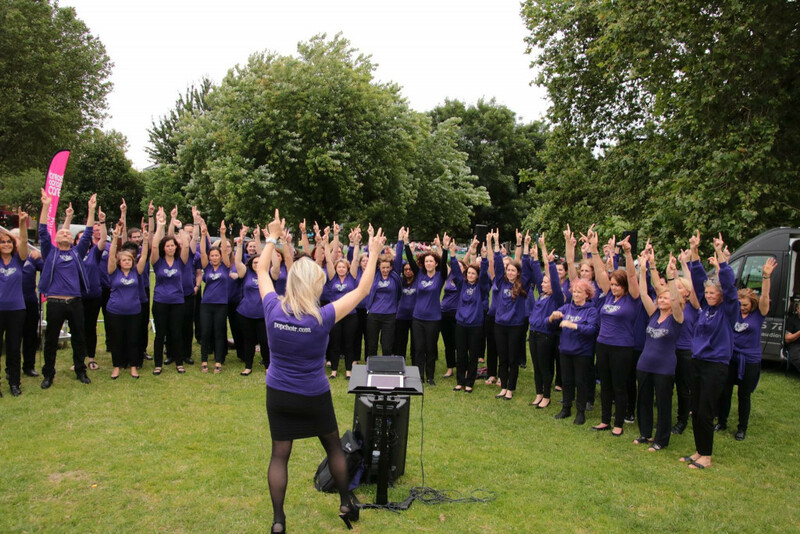 The freezing cold weather didn't put us off, we kept warm singing all of our favourites for a very attentive crowd. We raised a fantastic £821 on the night. 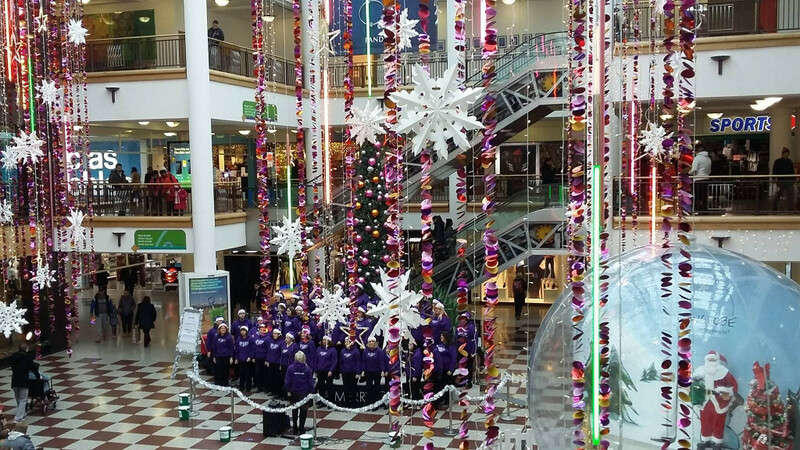 We were delighted to once again sing as part of a day of choirs at The Glades shopping centre in Bromley, in support of the Maypole Project, a small local charity. The Maypole Project in Bromley helps children with complex medical needs in the local area. They are a vital resource for any family facing a difficult and uncertain future with their child. Thank you to everyone who donated as they went by or while they watched. A fantastic £850 was raised during the day, and the money will fund vital work that will really make a difference to families in the area. An amazing time was had by all singing our Christmas songs to all the lovely passers by, who generously donated to the Samaritans. It was another freezing cold night but many a layer kept us warm to raise an amazing amount for the charity. The event raised a fabulous £7891 to help fund the Smaritan's amazing work. 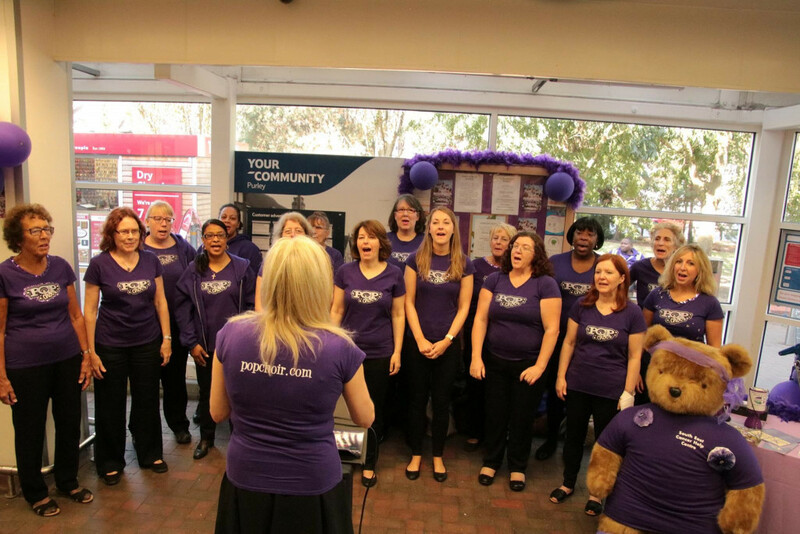 We were delighted to support Pancreatic Cancer UK, at St Pancras Station, to raise awareness for the disease. An amazing £2408.26 was collected during our performances. Cycle for Samaritans saw cyclists from 8 teams on static bikes complete a 247 mile challenge, in less than 12 hours. 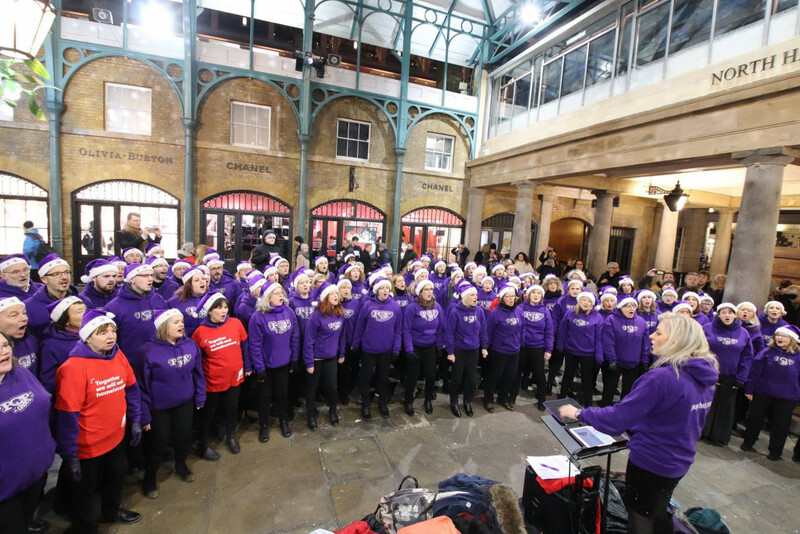 We very happily supported these amazing individuals by singing our hearts out for them and the communters of Charing Cross. Each team had a target of £2470 to raise, which reflects the 24/7 availability of the Samaritains' services. A fantastic £3284.12 was raised on the day. 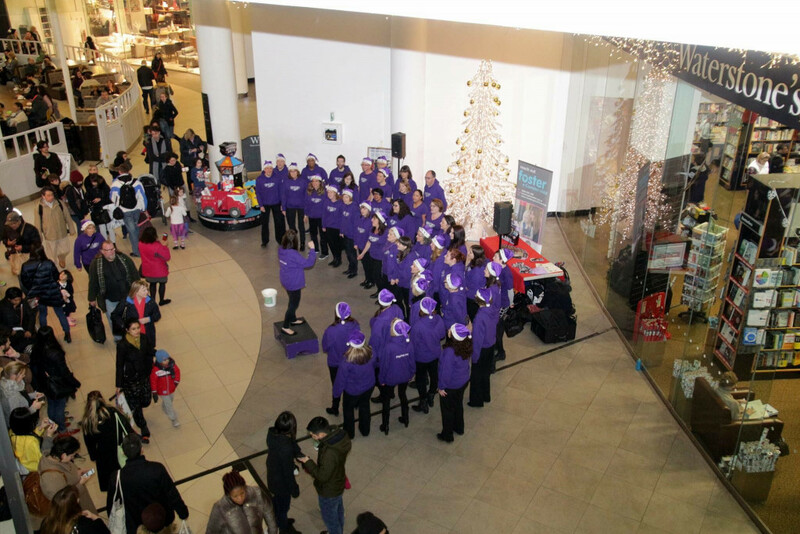 Well done to our singers, the volunteers from LAA and to everyone who was there enjoying the peformance who donated. Happy Christmas everyone! 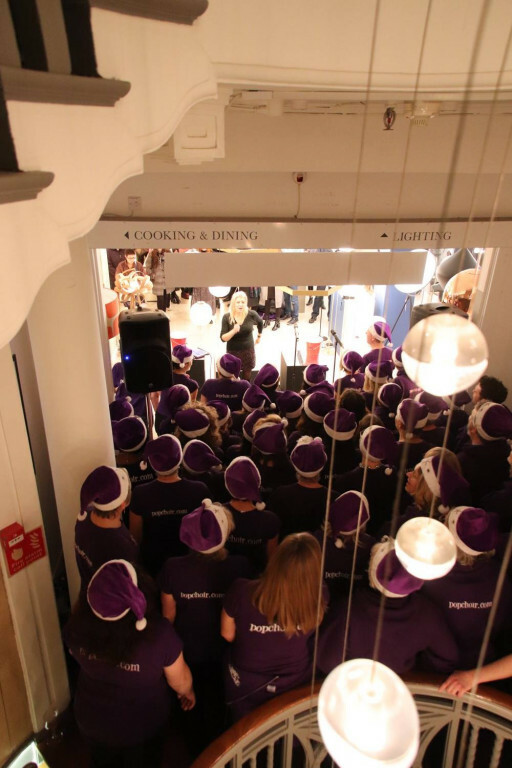 It's great to be out and about singing mongst the shoppers at Christmas - it's a great way to feel festive. 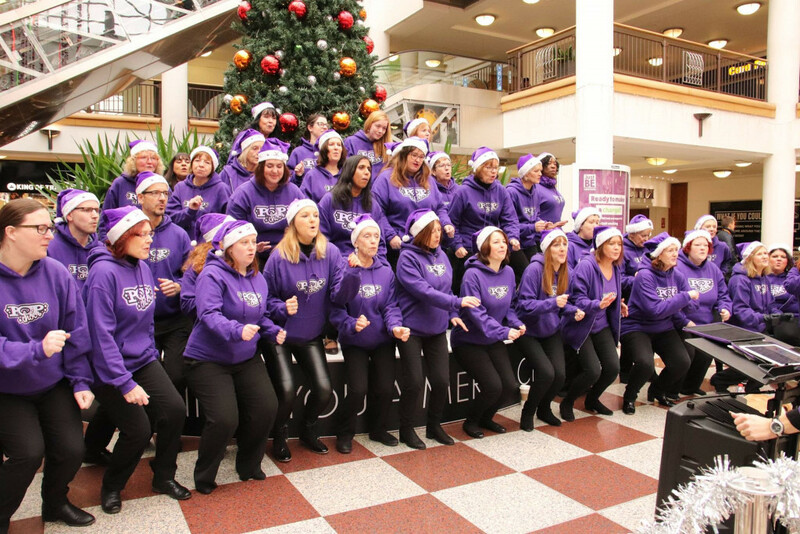 We were back in the 02 centre in Finchley on 3rd December to bring some Christmas cheer and to raise money for one of our favourite charities - Canine Partners. A great time was had by everyone, and thanks to the generosity of the 02's customers, we raised £209 all of which will be used to help train and provide assistance dogs to the disabled. 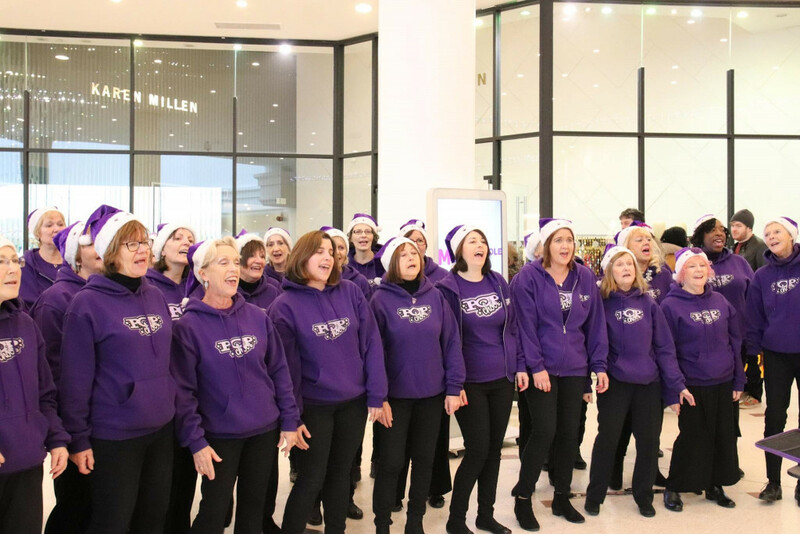 We entertained the shoppers and raised £140 for Canine Partners, to help transform the lives of people living with disabilities by training amazing assistance dogs. 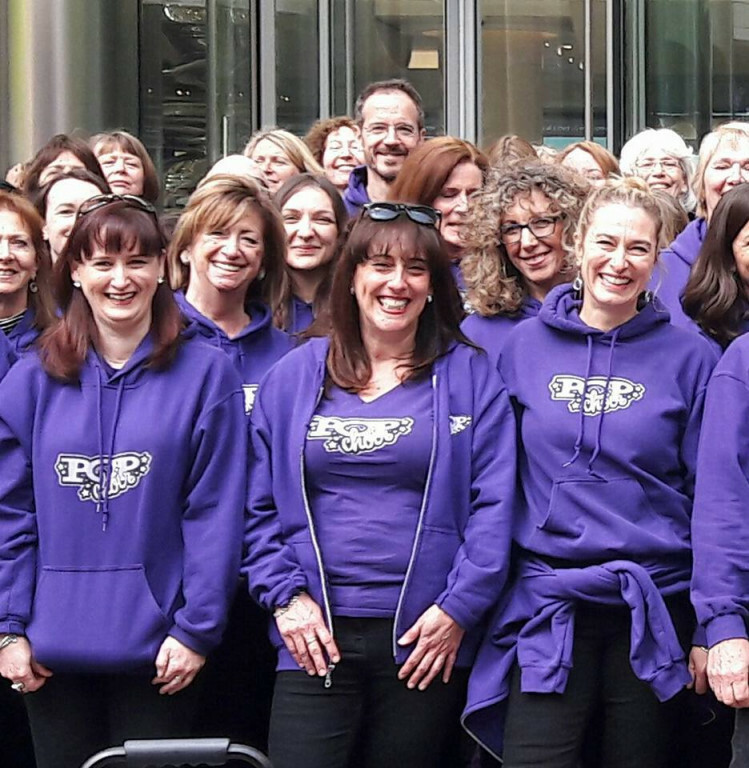 We love our annual trip to Canary Wharf to sing and support the incredible fundraising runners and their fabulous supporters! We were delighted to help The Maypole Project who provide support for children with complex and life threatening illnesses and their families. 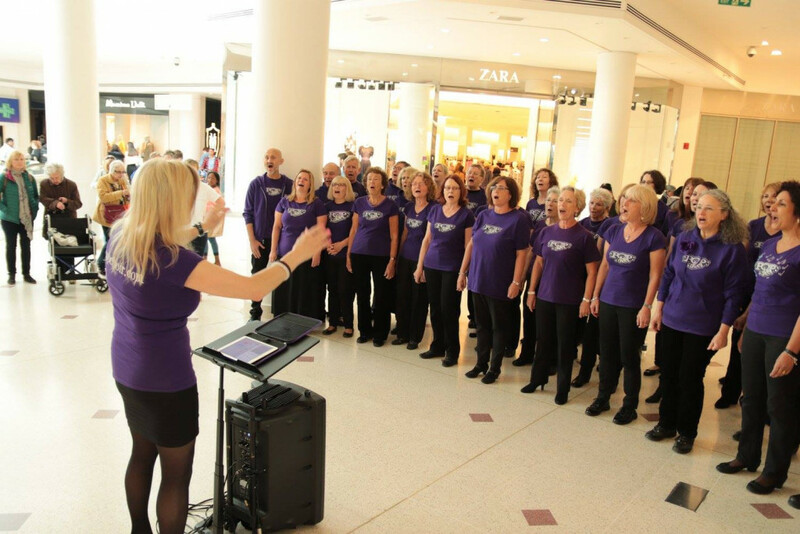 Our hour of singing raised £282.69 for this wonderful local charity. 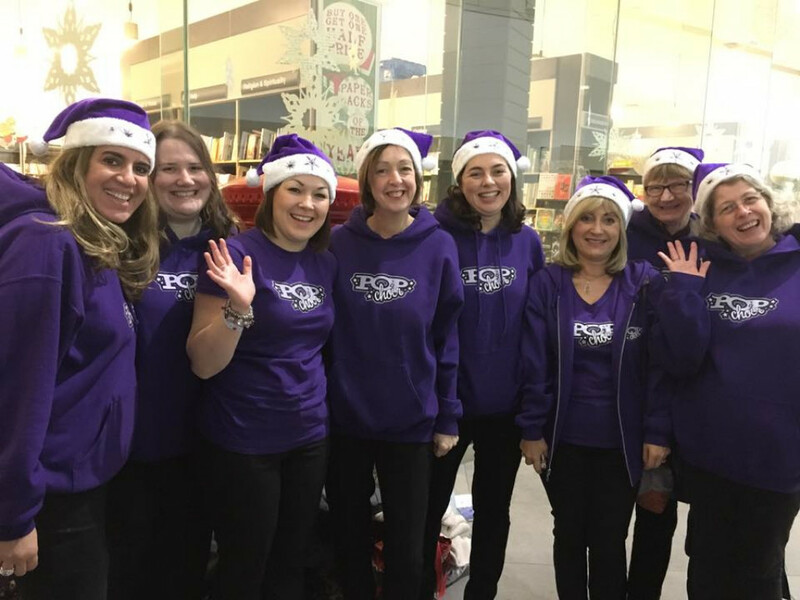 Christmas shoppers loved listening to our North London choir members belting our some festive favourites and we raised £140 in the process! We were thrilled to take part in ICAP's annual charity day, when £8.2million was raised for over 200 global charities. 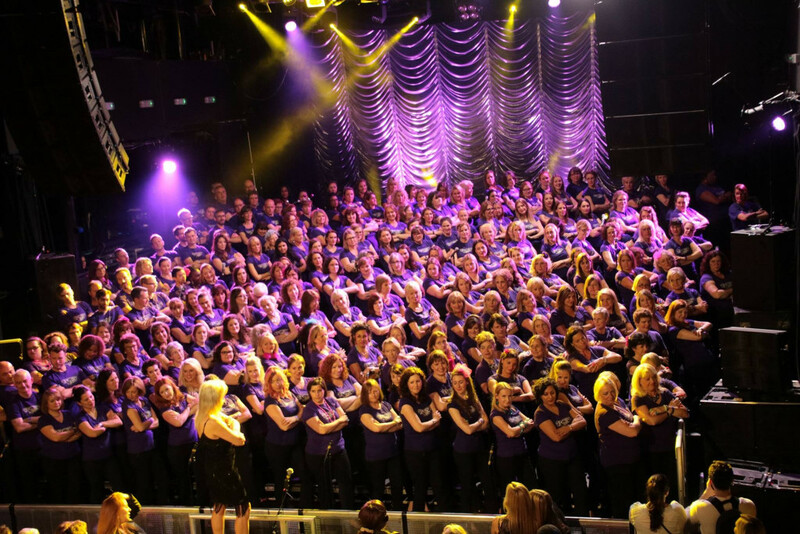 ICAP staff were joined by HRH Prince Harry and hosts of celebrities, and Popchoir were there to welcome them! 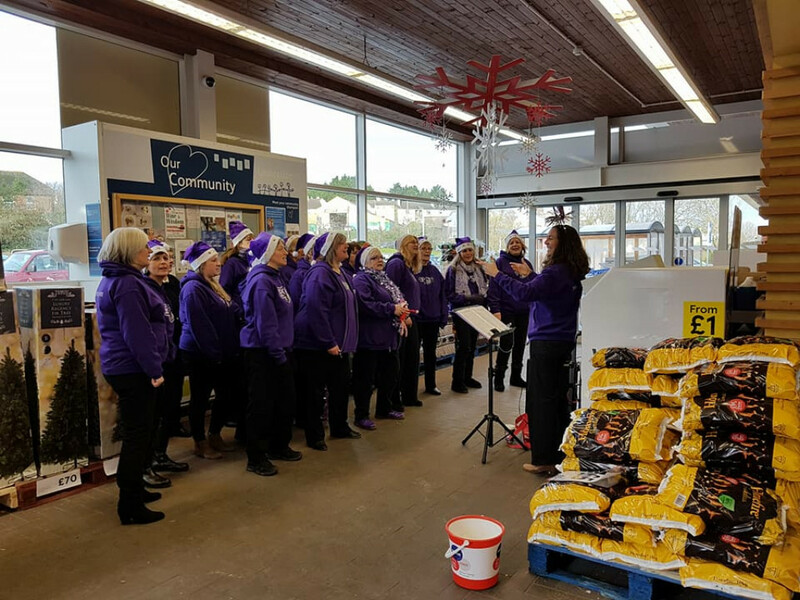 Tesco Launceston invited us to sing and raise funds for Diabetes UK and The British Heart Foundation. 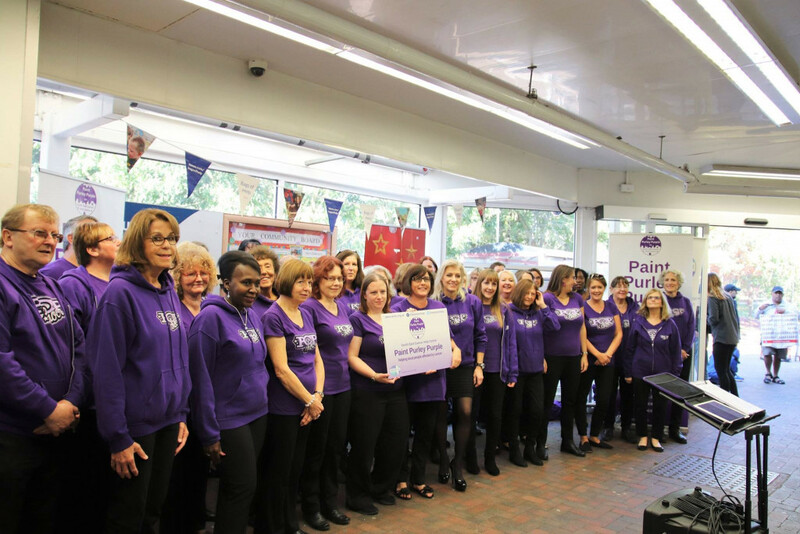 We joined the South East Cancer Help Centre to 'paint Purley purple' and raise vital funds for cancer support. 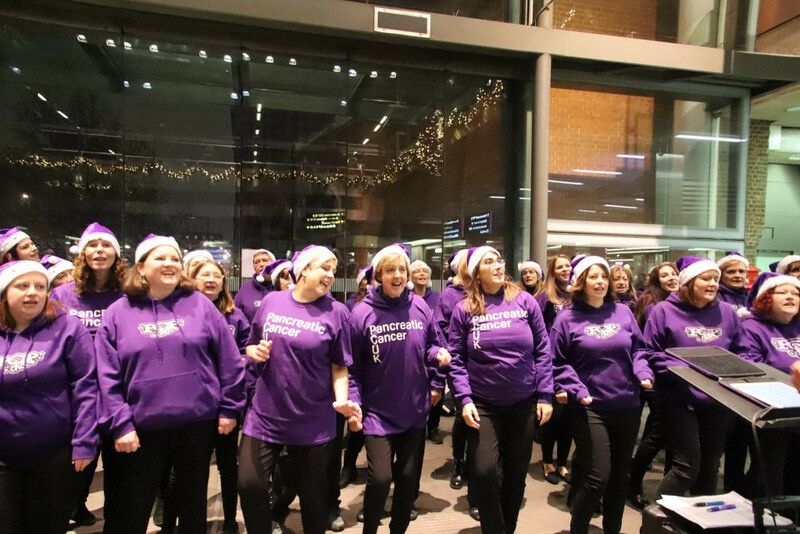 We sang the inteprid fundraising walkers off into the night as they made their way around a 5, 10 or 20 mile London route, raising funds for Breast Cancer Care. We loved being joined by some furry friends to help us with our harmonies when we arrived to sing at Charing Cross station. 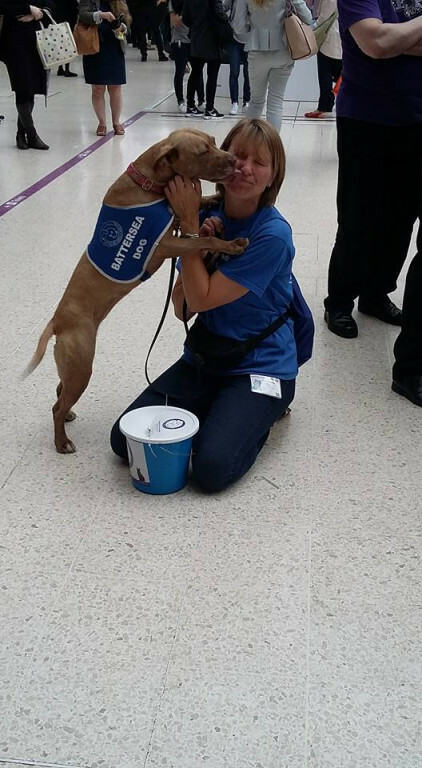 Despite the station being quite quiet we were delighted to raise £808.96 in aid of Battersea Dogs & Cats Home! We raised £778.81 in total from our collections on the 12th and 22nd December!